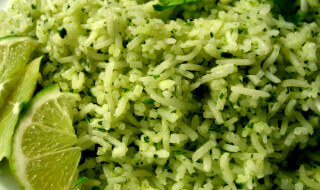 Rich in antioxidants and a wonderful flavour, coriander rice is a recipe that is sure to increase your craving for it. Wash coriander leaves under running water 2-3 times. Chop it and grind it along with ginger and green chili using very less water. (Add little water only if needed). Keep the paste aside. Heat oil in a pan, add cumin/jeera seeds, when it sizzles, add finely chopped onions and saute till it turns translucent. Then add the grounded paste, needed salt and saute till the raw smell goes and oil separates. Voila! A tasty, quick and satisfying rice dish is ready.